Potash is a very important input for potatoes affecting yield, quality and profitability. This leaflet reviews earlier and new information available on this topic. It provides guidance on best practice for potash use where crops are being produced for different markets, for different anticipated yields and where the crop is grown on different soil types. 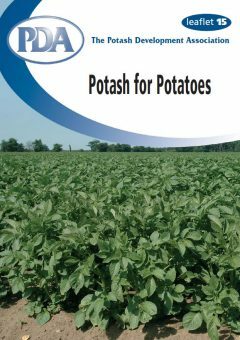 Potash (potassium, K) is an essential nutrient for all plants and has a major effect upon yield and quality of potatoes as well as the general health and vigour of the crop. It is involved in regulating the amount of water in the plant; in the absence of sufficient potassium crops do not use water efficiently. 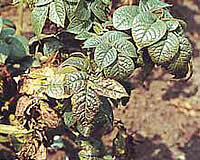 Also adequate K levels in the plant help it to withstand water stress during periods of drought. Potassium plays a vital role in maintaining the turgidity (rigidity) of plant cells. Because of its importance in turgor maintenance, potassium is essential to obtain maximum leaf extension and stem elongation. This helps to achieve rapid ground cover so maximising interception of sunlight and thus the rate of growth in the critical early periods of the growing season which is of particular importance for spring sown crops such as potatoes. Another need to ensure an adequate supply of K is because it plays a vital role in the movement of sugars, produced in the leaf by photosynthesis, to the tubers where the sugars are converted to starch. Potassium also contributes to various aspects of tuber quality that may be vital for a marketable sample. The balance between nitrogen (N) and K supply is of particular importance for this crop. There is little doubt that crops deficient in potash are less able to handle stress caused by drought, waterlogging, frost, heat, wind, etc. However, it appears that there is no advantage to gained from applying larger amounts of K than those justified for yield or replacement requirements. Whilst yield variation will occur according to the growing conditions in different years, smaller yields in “poor” years can be minimised by ensuring an adequate potash supply. Yield loss and adverse effects on quality may occur without any visible symptoms of K deficiency being seen in the leaves. When symptoms are identified, potential yield loss is likely to have already occurred and it is unlikely that this can be recovered by adding K. The visual signs of potassium deficiency are that the leaf margins, especially on the older leaves, become brown and leaves die prematurely. In severe cases, growth is much retarded and the leaf canopy may not close between the rows. Growth may be very uneven across the field and this can have serious consequences for the yield and quality of the crop. Potassium occurs in nature as various salts that occur in very large, mainly underground, deposits. These deposits can be mined and the salts purified to supply the potash fertilisers used commercially. These K fertilisers are soluble in water and when dissolved they separate into the two components, the cation K+ and the anion Cl–, SO42-, or NO3–, according to the form of the fertiliser applied. For example muriate of potash separates into K+ and Cl– ions. The plant always takes up the cation, (K+) but the chloride (Cl–), sulphate (SO42-) and nitrate (NO3–) are also required by plants. Measurement of potassium in soil or plant material is expressed as elemental K. Potassium fertilisers are commonly referred to as potash and their content is measured as K2O. 1 kg K = 1.2 kg K2O. 1 kg K2O = 0.83 kg K.
This is by far the commonest form of potash fertiliser and contains 60% K2O. The other component, chloride, is also an essential plant nutrient but is very rarely in short supply in the UK. Chloride levels in soils are maintained through fertiliser application and natural deposition in rain and it is lost from soil by leaching in drainage water. The chloride ion has no adverse effect in the soil. This provides two nutrients 50% K2O and 45% SO3. Sulphur inputs are increasingly required for UK crops as other sources decline and SOP is highly effective being readily soluble in the soil solution. However, sulphate, like nitrate, is readily lost from soil in drainage water, so SOP should be applied in the spring and not in autumn. If the sulphur content is not required, the potash content of SOP is more costly per kg K2O than that of MOP. SOP provides specific quality attributes for potatoes. Again this fertiliser provides two nutrients because it contains 46% K2O and 13% N This is a speciality fertiliser normally used for high value crops where a fully soluble form of nitrogen is needed in conjunction with potassium. It is sometimes used as a top dressing for potatoes to secure quality benefits, but its relatively high price demands a high return to make it cost effective. It can be produced in very pure forms suitable for use in fertigation – where plant nutrients are added to irrigation water. Potatoes take up more potash than many other arable crops. In the six weeks after plant emergence, the crop will take in at least two thirds of the total K uptake. During peak vegetative growth, potatoes may require 10 kg K2O/ha per day from the soil. Maincrop potatoes contain the maximum quantity of potash in late July – early August and this may be more than 500 kg K2O/ha for high yielding crops. As the tops die back and the plant matures, some potash is returned to the soil. By harvest more than 75% of the maximum K uptake is found in the tubers, which typically contain around 5.8 kg K2O per tonne of tubers. For the determination of nutrient removal this figure is assumed to be constant over the normal yield range. From the potash offtake figure it is possible to calculate the maximum K uptake by the crop. For example, a crop yielding 40 t/ha will remove 40 x 5.8 = approx 230 kg K2O/ha but this is only about 75% of the maximum supply needed, which would be over 300 kg K2O/ha (230 x 1.33 = 306)*. A crop yielding 60 t/ha will remove 60 x 5.8 = 350 kg/ha which will have needed a maximum supply of over 450 kg/ha (350 x 1.33 = 466). Varietal and husbandry improvements have resulted in a continual increase in potato yields – for second earlies and maincrops, yields have increased from around 20 t/ha in 1960 to approaching 50 t/ha in recent years. This has an important implication for potassium supply because it needs to match this increased level of production. * The factor 1.33 is derived from 100/75; i.e. if 75% of the total crop uptake is in the tubers at harvest, the maximum uptake is 100 75. All soils contain large quantities of potassium but only a small proportion of this is available for crop uptake in a season. Potassium is held by the clay minerals and organic matter in soil and is not potentially leached or lost in the same way as nitrate and sulphate. On the lightest textured and shallow soils some potash may move down the profile from the topsoil to a greater depth than can be reached by the roots of shallow rooting crops. However, in the majority of soils if more K is applied than is removed in the harvested crop, the excess will simply increase the amount of soil K reserve for following crops. If offtake is greater than the quantity applied, soil reserves will be depleted. Hence normal manuring policy is to identify the appropriate level of soil K for the individual soil type and calculate potash use to maintain it, primarily by replacing the quantity of K removed in the harvested crop. Potato plots at Rothamsted illustrate the value of soil K reserves. Four potash fertiliser treatments on soil at K Index 2 (left), compared with the same treatments on soil at K index 1 (right). Most crops take up nutrients mainly from the ploughed or cultivated depth of soil. Where crops root more deeply some nutrient may be taken up from supplies at greater depth. Potato root systems are generally far less extensive than those of crops such as winter cereals or sugar beet. Consequently nutrient uptake from the deeper soil horizons is much less important for potatoes. However, improved soil cultivation and de-stoned bed systems increase the potential soil volume available to the crop for nutrient and water uptake. Medium and heavy soils may also release some potash from non-exchangeable reserves which are not measured by a normal soil analysis. However the potato crop is commonly grown on lighter soils which do not retain large amounts of non-exchangeable K.
Relative yields from the trial shown above. Application of fresh potash fertiliser could not overcome the effect of the low K soil. Potash may be taken in via the leaves from foliar applications of soluble K fertilisers but only a very small proportion of the large total K requirement can be supplied by this route and foliar application tends to need a more expensive source of K than for soil application. This is because it is necessary to use a very soluble K source and to avoid the risk of the salt scorching the leaves. Potatoes need an amount of potash in the soil that can satisfy both the peak rate of demand during early vegetative growth and the total uptake in late summer. Where soil reserves are insufficient to meet either of these two requirements, the soil supply needs to be supplemented by adding K in fertiliser or manure. However, these additions may not be as efficient in providing K as are the reserves in the soil. Long term experiments at Rothamsted and Woburn have shown that yields from impoverished soils may not match yields on fertile soils even if large amounts of K fertiliser are applied (see illustrations and chart above). Also, it can take several years to improve a soil with a low K status once soil K reserves have been run down. Reliable methods of soil analysis have been developed over many years in the UK to indicate the ability of a soil to supply a specific nutrient to a crop and to show the need for any additional input. Samples are normally taken to 15 cm and thus the analysis does not indicate possible supply of a nutrient from deeper in the soil profile. Also for K current methods of analysis do not predict the release of non-exchangeable K which can supplement available K on some soils. As explained earlier neither of these sources is as important for potatoes as for some other crops. Soil analysis is not a precise indicator of a soil’s ability to supply K to a plant for a number of reasons. Invariably there are large natural variations in the level of plant available K within a field. 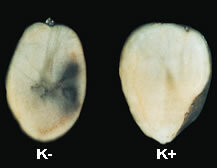 Also the uptake of K is affected by how easily plant roots grow within a soil to take up the nutrients that are there. However, the Index system that has been developed provides a practical and worthwhile guide relating to crop response as shown below. The increasing recognition of varietal differences in nitrogen requirement and response has lead to interest in whether there should be similar discrimination for potassium. It has been suggested that indeterminate varieties (e.g. Cara) develop a better root system that may improve uptake and utilisation of K from the soil and so affect potash requirements. However, there is insufficient evidence to differentiate recommendations for K depending on variety except where certain varieties produce large yields and require larger potash dressings to replace the greater offtake. It is important to identify the relevance and interaction of these different reasons. A very large number of experiments from many countries have confirmed that potash supply has a major influence on yield. Therefore, in the short term a grower needs to know how much potash to apply for the best economic return. However, the increase in yield to an application of K fertiliser will depend on the supply of K from the soil, i.e. the K Index of the soil on which the crop will be grown. For the UK, current recommendations in RB 209 are based on the average amount of K required to achieve optimum yield for crops grown on soils at different soil K Indices. As in all experimental data, there was considerable variation for different sites and years. In general, however, the response to added K is usually large at low levels of soil K and the requirement for added K tends to decrease as soil K level increases. There will always be variations from this general interpretation and it is important to attempt to identify site specific factors that may cause such variation. These include the volume of soil explored by roots, the availability of water and nitrogen and phosphorus. For example, increases in yield can occur at high soil K levels because too little of the volume of soil was explored by the roots. There are also cases where little or no increase in yield to applied K was obtained at low soil K levels, perhaps because the roots were very efficient in exploring the volume of soil available to them, and there was adequate moisture throughout the growing season. In the latter case, such results have been used to argue that the amount of potash applied can be reduced or omitted. This would, however, represent a negative potash supply/removal balance and lead to reducing soil K reserves. Whilst there is no precise critical value for the soil K Index, maintaining soils at the upper end of K Index 2- and the lower end of K Index 2+ is still seen as an appropriate target range to aim for on most soils. These levels are unlikely to be achieved on true sands and loamy sands because they have so little ability to retain exchangeable K and for these soils it is essential to apply adequate K as fertiliser and/or manure each year. If the response requirement is less than the amount of potash removed by the crop it would run soil reserves down and would not be sustainable in the longer term. As soil K reserves are reduced, the response to added potash fertiliser would rise and the optimum “response” dressing would become larger. This may be a theoretical ideal economic optimum approach but assumes far more precision in adding K fertiliser than is possible in practice and ignores the fact that potash held in historically accumulated reserves is more efficiently taken up and used by the plant than fresh fertiliser K.
It is also argued that a “response” dressing approach to K manuring is applicable for the increasing area of the crop that is grown on land rented for a single year. Again if the “response” dressing is less than the amount of K removed, soil fertility would be depleted by this approach. This is not equitable for the landlord and cannot be generally recommended as a sound soil management practice. Potash supply also contributes to quality characteristics that may affect marketability of potatoes such as dry matter, specific gravity, sample size and tuber number, starch content, fry colour, fat absorption, internal blackening, susceptibility to mechanical bruising, cooking quality and flavour. Many other factors also affect these characteristics (often to a greater degree than potash) and additional potash supply will not improve the characteristic where it is being controlled by an excess or limitation of another factor. If adequate potash is available to the crop for full yield, additional nutrient is unlikely to provide cost effective additional quality benefits. The amount and form of potash can affect various aspects of quality but other factors are involved and often have a greater impact. Requirements for different markets will require particular attention to specific aspects of quality. As indicated above, extra potash beyond response or replacement recommendations is not normally justified by quality benefits alone. Applying large amounts of potash fertiliser generally reduces the dry matter (DM) content of tubers by up to 2%. The effect of K supply on tuber DM appears to vary greatly with variety. Where DM is important and levels need to be improved when muriate of potash (MOP, potassium chloride) is being used, splitting the total requirement to half in the autumn and half in the seedbed can help. Switching from MOP to SOP (sulphate of potash) applied in the spring may have a greater effect than splitting the MOP application and may improve DM by up to 2%. DM is affected to a greater extent by factors such as N supply, irrigation and variety. Both specific gravity and starch content tend to follow dry matter and where these characteristics are important it is necessary to ensure that the correct amount of K is applied and to consider the use of SOP rather than MOP. Yield response to potash is normally associated with an increase in average tuber size and weight. The use of sulphate of potash instead of muriate of potash may be beneficial where larger numbers of small-medium size tubers are required such as for seed, canning, salad etc. The benefit will be more pronounced under dry or stressed growing conditions. Lighter colours on frying can be very important for crisping potatoes and adequate potash supply can improve this aspect of quality. 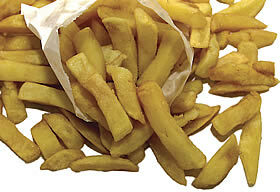 Muriate appears to be marginally superior to sulphate for this characteristic, however sulphate does appear to reduce the quantity of fat absorbed on frying and this has important cost implications for the processor. Tuber bruising and damage is caused by mishandling but will be worse where there is a limited supply of potash. Additional potash beyond the optimum required for yield or replacement will not help to prevent a damage problem. This is aggravated when tubers have a large DM content and is alleviated by applying larger amounts of potash. Muriate is somewhat more effective than sulphate in reducing the occurrence of this problem but an adequate amount of K is the more important factor. It is desirable to avoid growing potatoes on high pH soils but there is some evidence that where this is practised, SOP can reduce the severity of tuber cracking. This is a very subjective characteristic but there have been a number of taste experiments that suggest that the use of sulphate of potash results in a product with a better flavour. Many other factors especially the method of cooking and variety are more important for cooking quality than nutritional factors, but there is some evidence to suggest that potash reduces disintegration on boiling and mealiness of the cooked product. to reduce or omit applications on soils which are above an adequate level. Applying these principles for potatoes gives the following recommendations. The ‘replacement’ value is also referred to as the ‘maintenance’ (M) application. The ‘replacement’ or ‘maintenance’ quantity is calculated by multiplying the yield in t/ha by the potash content per tonne of potato tubers harvested (5.8 kg/t of fresh weight) i.e the quantity of potash removed from the field in the harvested crop. Thus for a yield of 50 t/ha of maincrop potatoes, the replacement value is 290 kg K2O/ha. For a 30 t/ha early and seed potato yield, a potash replacement of 175 kg K2O/ha is required. The additional applications of +60 and +30 kg K2O/ha at Indices 0 and 1 respectively will go some way towards increasing the soil K Index, and may be as much as can reasonably be charged to the crop being grown. However, significantly more potash will be required in order to raise the Index to a satisfactory level in the short term, and such additions should be costed as ‘capital improvement’ items, not as a variable cost against the crop in the field. These are general guidelines which will in most situations ensure an adequate supply of K to achieve optimum yield. Soil analysis should be used as a starting guide rather than a final definition of requirement. Site specific consideration should also be given to soil structure, soil depth/volume, stone content, organic matter level, possibility of drought, possibility of K leaching on very light soils and other relevant factors. There are large variations in uptake and removal in practice. However, the usual method for calculating the replacement K requirement is to multiply the appropriate K removal factor by the yield as shown below. Thus the requirements of crops with very different growing periods and yields (e.g. earlies, canners, main crops, seed, etc.) are covered by the same approach. In a replicated trial on a loamy sand soil at K Index 1 (K 79 mg/L) at ADAS Gleadthorpe in 2002 (funded by BPC), 0 and 325 kg K2O/ha (RB209 recommendation for the site) were applied to 8 potato varieties and their tuber yields measured and K offtakes estimated. Although not a potash response trial and whilst the study did not identify optimum potash application rates, the data clearly demonstrate large yield responses to potash fertiliser for all the potato varieties tested on this K Index 1 site. Mean response of all varieties was 12 t/ha giving an excellent benefit:cost ratio of 12:1. The amount of potash removed was estimated using actual yields and a standard potash content. The average offtake of 459 kg K2O/ha for all varieties was 134 kg/ha larger than the 325 kg K2O/ha applied and the range of K2O soil deficits was from 41 to 203 kg/ha for different varieties. Thus, there was a depletion of soil reserves for all varieties. The current principles of potash use recommend that this shortfall should be avoided by matching potash use to offtake plus an addition of 30 kg/ha for this loamy sand at the low end of Index 1 (459 + 30 = 489 kg K2O/ha). High yielding potato crops remove very large quantities of potash and a manuring policy based on replacement, with supplements where K reserves are low, will generally provide adequate potash to ensure optimum yield not only of potatoes but of other crops grown in rotation. 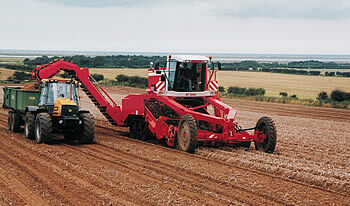 Apply up to 190 kg K2O/ha in the seedbed. For higher rates some should be applied earlier in the spring or in the previous autumn/winter. Where amounts over 300 kg/ha are required, half the total should be applied in the autumn/winter and half in the spring; this is to avoid any risk of excessive ‘salt’ concentrations adversely affecting root growth. On lighter soils the winter application should be made after the year-end. Placement of nutrients in the vicinity of the seed can improve fertiliser use efficiency and this can be important on soils of low nutrient status. However, placement of large amounts of soluble nutrient close to the seed can cause damage to roots especially under dry conditions. It is not recommended to place more than a total of 250 kg/ha of nitrogen and potash near to the seed. Around a third of the national potato crop receives some manure but there appears to be only a small allowance for the potash contribution from this source. Estimates of nutrient contribution from manures can be made easily using typical values (see PDA leaflet ‘Nutrient content of manures‘) and fertiliser rates should be adjusted accordingly. An excess of nutrient not only causes unnecessary expense but may give additional problems. The interest in foliar phosphate has lead to consideration of foliar potash. However the large quantities of potash required and the lower responsiveness of the crop to potash compared to phosphate does not suggest a likely response to foliar potash and there is inadequate evidence to support any general recommendation here. Also unless great care is taken there is a risk of scorching the leaves. Where large quantities of potash are needed because of high potential yields on light soils with low potash reserves, a case can be made for top dressing potash in conjunction with nitrogen at tuber initiation, especially where irrigation is available. Again there is insufficient evidence at present to support this with firm recommendations. There is some evidence that potash availability and uptake can be reduced on soils where magnesium levels are excessive, even though the level of soil K may not be deficient. This situation is most frequently associated with long term use of magnesian limestone to correct pH. It is suggested that where the soil concentration of Mg is more than double that of soil K, potash applications may need to be increased above the normal recommended rate to achieve adequate potash nutrition of the crop. Further studies are being undertaken.